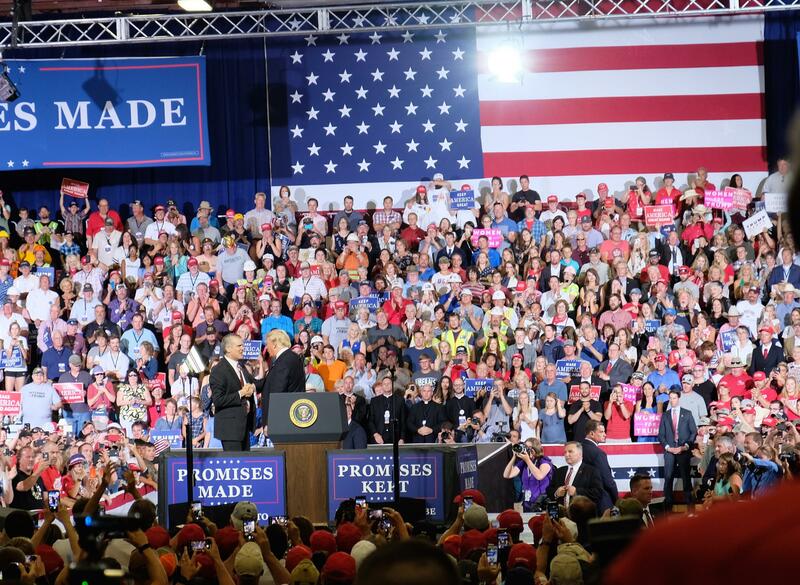 President Donald Trump called on GOP U.S. Senate candidate to briefly join him on the stage at the Expo Park during Trump's campaign rally in Great Falls. Trump said it’s time Montanans send someone to Congress who will fight for them and vote to support his agenda. He complained Tester has voted against replacing and repealing Obamacare, his tax cut proposal and a proposal to stop late term abortions. Trump shook hands with some in the audience as he departed the stage after speaking for about an hour. He called Tester dishonest for attacking his former White House physician and VA Secretary nominee Ronny Jackson, who later withdrew his name before his confirmation hearing. Previously Trump told Fox News in a wide ranging interview that Tester, the ranking Democrat on the Senate Veterans’ Affairs Committee would have “a big price to pay in Montana” for releasing information alleging misconduct by Jackson. “And that’s probably why I am here because I won Montana by so many points I don’t have to come here,” he said. Trump won Montana by 20 points in 2016. Tester, a farmer from Big Sandy, ran a series of full page newspaper ads yesterday that welcomed Trump to Montana. They also thanked Trump for signing bills Tester worked on to help veterans in the U.S. Senate. Two members of the crowd. 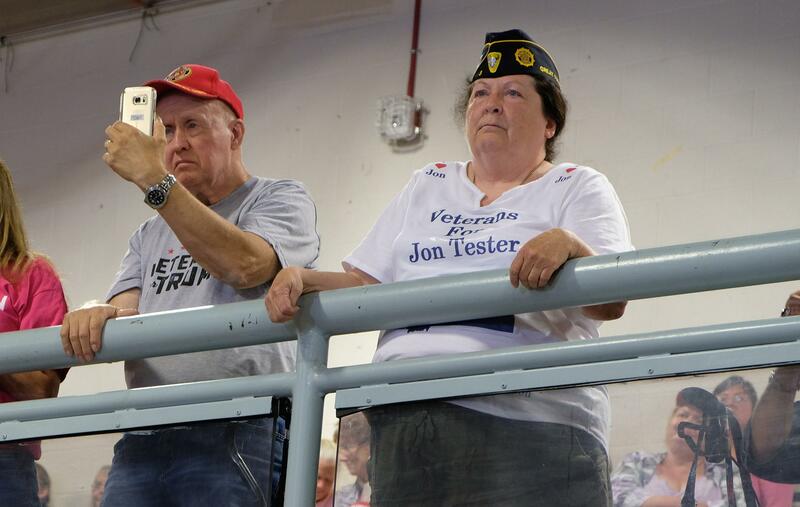 One wore a T-shirt that said Veterans for Trump, left, while the other wore a T-shirt that said Veterans for Jon Tester. After the event, Tester’s campaign spokesman Chris Meagher sent out a press release that said Montanans want someone who will roll up their sleeves and fight for Montana. “Jon’s record is clear—if it’s good for Montana, Jon works with anyone from either party to get things done. If it’s bad for Montana, he’ll stand up to anyone,” said Meagher. He also criticized Rosendale, who moved to Montana in 2002 from Maryland, where he worked in real estate and as a land developer. Tester, meanwhile, held a listening session in Billings yesterday with agricultural producers and local businesses to discuss how tariffs will impact the Montana economy. Tester faces challenges from 3 candidates on the November ballot, besides Republican Matt Rosendale, there’s Green Party candidate Steve Kelly, and Libertarian Rick Breckenridge.